Having analysed the demand side K! supply side of labor, we shall now see how their contraction determines the wage level. This is shown I . (a) we take the case ‘1 an industry. The curve SS represents supply to thc Industry. DD is the demand curve. They intersect at E. I he wage level, therefore, is OW (= EN). (b) represents the case of a firm. Under perfect competition. the firm has to accept the market wage OW settled by the industry above. (a) Diwali a straight line towards (b) representing the condition of the firm. We see that this extended line W-AW cuts. 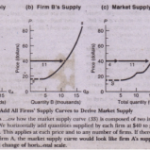 the MRP (marginal revenue productivity) curve of the firm at F’ (b). But at this level. the average revenue productivity (ARP) is MR which is greater than the wage OW. Hence. all the firms (this particular finn is representative of all firms in the industry) are making supplemental profits at this wage level. This will lead to entry of new firms in the industry: the demand for labor will increase and the wage level will go up. Thus. the supplemental profits will be competed away in the long-run by the entry of new firms. The new demand curve D’ D’ cuts the supply curve(0) at F. The wage level in this situation will be OW’ which is higher than the original wage level OW. 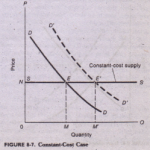 This is how the interaction of demand and supply determines the wage. We can see that when the wage rises to OW’. the equilibrium is at F’. At this point, average re enue productivity (ARP) and marginal revenue productivity ( iRP) are equal. and the average wage OW’ is equal to both of them. It can also happen that the occurrence of pernormal profits attracts some firms from outside, hicb may further increase the demand for labor to Do The wage level will then be OW”. Here, the a erage revenue productivity (ARP) is less than the wage OW”. i.e.• the firms are suffering losses. The result ill be that some firms will leave the industry and the wage will come down to the level of OW”. Here. the wage. 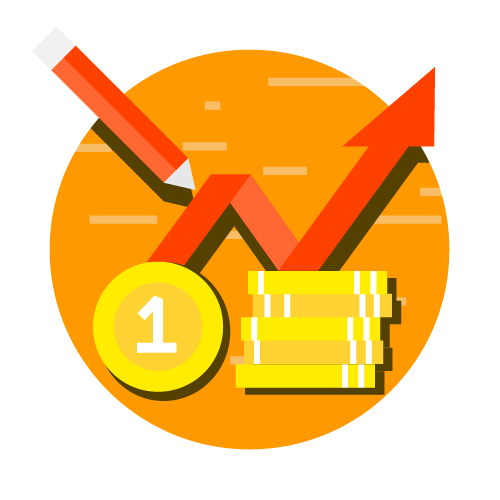 the marginal revenue productivity and the average revenue productivity are all equal. Thus. under competitive conditions, wages are. in the long run equal to the marginal as well as average productivity of labour. If marginal productivity is greater than average productivity. it will be worthwhile to employ more labour till marginal productivity falls to the level of average productivity. On the other hand. if marginal productivity is less than average productivity. less labour will be employed and the marginal productivity will rise to the level of averag productivity. Marginal productivity and average productivity thus tend to be equalised. Since wages are equal to marginal productivity. they are also equal to average productivity. .Here. OR represents the wage level. AP is the average productivity curve and MP the marginal productivity curve. They intersect at P which shows that wages are equal both to the marginal productivity and average productivity. When AP is rising MP > AP. and when AP is falling. MP <AP. But when AP is neither rising nor falling. MP = AP. Hence.